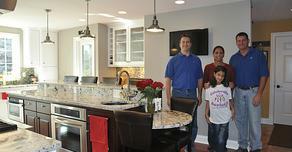 We’re committed to remodeling and to serving you with quality and value. We'll come to you, listen to your needs and wants, and then come back to you with a logical, feasible plan that works for you. Our first-time customers continually become our long-term customers. Time and time again, choosing us for all of their remodeling needs. Call us today, and see what our commitment to quality is all about! We may not be related, but you’ll feel like we’re family.